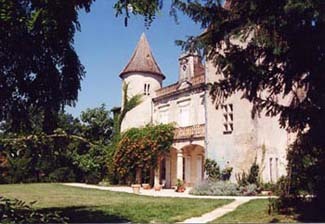 Constructed in the 15th century, the Boyssonnade family possessed the castle until the 16th century when the De Bourgoin and later the De Galaup families acquired the property. Nine towers marked the original castle, but reconstruction in the 18th century left only two, with the third, octagonal tower added in the 19th century. If traveling as a family, Manoir de Roquegautier makes a great choice, as some rooms can hold more than four people, and the price is reasonable. One room in the outbuilding can hold up to seven people. If traveling as a pair or a single, I would definitely opt for a room inside the main house. Any French you might speak will be helpful. Rooms: 6: 3 in manor, 3 in outbuilding; rooms can hold from 2-6 people. Cancon is 17 km northwest of Villeneuve-sur-Lot, off of route N-21. Brigitte and Christian Vrech and their daughters have created a lovely bed and breakfast inn, located just on the southern reaches of the exquisite Dordogne area. Freshly decorated rooms have thick white quilts covering the beds, with the occasional antique piece as an accent. All rooms have private baths. Unlike some bed and breakfasts, meals are available five nights of the week. Prepared with fresh home-grown produce, the excellent dinners reflect the cuisine of the Périgord area. Meals are served at a common table with different hours for adults and children. A friendly, family-run bed and breakfast.